This photo was taken at the lowest tide that we saw this past weekend in Neskowin, OR. This view is looking south towards Proposal Rock. The water is extremely high still, even at low tide, for this stretch of beach. Normally during low tide, the water comes in only about 1/3 of the width of the large rock, leaving the 2/3 that face land accessable. On a normal day, you can climb the rock to the top for an amazing view of the ocean stretching out as far as you can see. Not this weekend though. The ocean surrounded the entire rock and never retreated enough. The rock barrier leading up the dune into town is a foot behind me as I am taking this photo. There was only a few feet of sand in places to keep your feet dry before the waves came up and got you. This made it impossible for any good beach strolling. Lovely shot - so full of atmosphere! Pretty! Im coming out there in a few weeks! I cant wait to see the shore and take some pics like this! 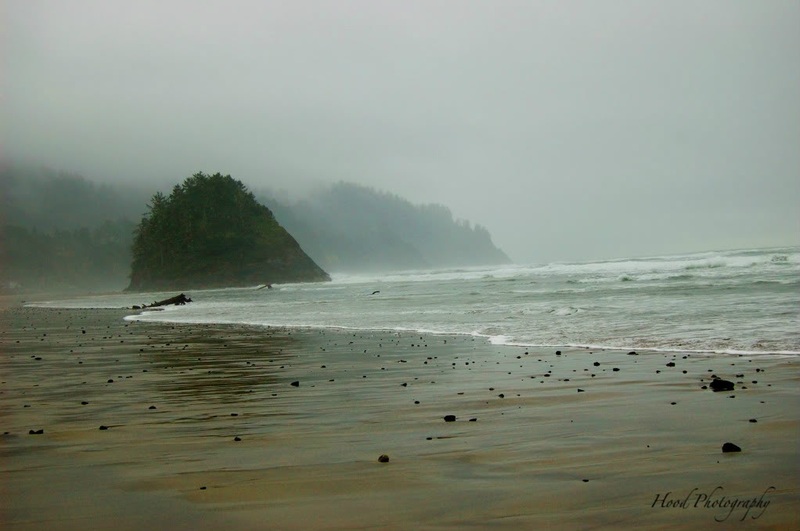 Oregon has some of the most beautiful, moody coastline. Thanks for the great picture. a bit scary, actually. great pic. It looks like a lovely beach with water that's shallow for a long way out. Love the fog. What a gorgeously atmospheric photo. What a magnificent photo. I love the lopsidedness of the hill in the forefront. Sea mist creates the most beautiful atmosphere. Please come take a peek at the laughters at my page. Thank you! PS.. I am now following your blog, would you follow me back too? It's hard to beat a good beach - this photo is superb! How's the beachcombing? Find anything interesting? What a beautiful photo! I went to the same place when I was a teenager back in the 80's and have a similar photo. My brother and I are running around in the water. Thanks for the memories!